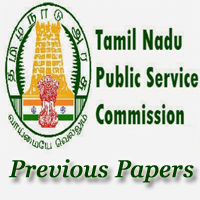 Download TNPSC Group 2A Previous Papers that are updated here. Therefore, the candidates who are attending for the Combined Civil Services Examination – IIA can check the Previous Papers for proper preparation. Hence Download this Tamilnadu PSC Group 2 Exam Old Question Papers at free of cost from the provided links below. And the Tamil Nadu PSC Combined Civil Services Exam Question Papers with solutions are also available on our page. Also, check the official site of the Tamil Nadu Public Service Commission i.e. www.tnpsc.gov.in for extra details about the CCSE Group IIA examination. Chek our home page to get Previous Papers. The Previous Question Papers of Tamil Nadu PSC Group IIA Exam are very important for exam preparation. It is a Great news for the individuals for those who are preparing for the Tamilnadu State Govt Jobs. The Public Service Commission of Tamil Nadu has issued the latest recruitment notification. The notification is for the Combined Civil Services Examination with huge vacancies. So many aspirants are in a hurry to apply for this Group 2A jobs of Tamil Nadu PSC. Therefore the individuals who want to appear for the TNPSC Group 2A Examination. They need to consider the competition for the Tamilnadu Public Service Commission Jobs. To withstand this tremendous competition, the applied candidates should have a better preparation for the CCS Exam II. The better preparation is only possible with the TNPSC Group 2A Previous Papers PDF. Because there are so many profits while practicing the Previous Papers of Tamilnadu PSC Combined Civil Services Exam. So that you can also analyze the kind of questions which are going to come in the exam while following these TNPSC CCSE Previous Year Question Papers. Name of the Organization Tamil Nadu Public Service Commission. Post Name Group 2A Posts. Name of the Test Combined Civil Services Examination – IIA Non -Interview. No of Vacancies 682 posts. Starting date for applying online April 2017. Closing date for applying online May 2017. Date of CCSE IIA Examination 6th August 2017. Job Category State Govt Jobs in Tamil Nadu. Work location Tamil Nadu, India. The Group 2A Exam of Tamil Nadu consists of objective type questions. There are 200 questions in this Tamilnadu PSC Combined Civil Services Examination – IIA Non – Interview Exam. And the total maximum marks of this TNPSC CCSE Exam are 300 marks. The exam duration of the Tamilnadu PSC Group 2A exam is 3 Hours, i.e., 180 Minutes. Check the topics that are related to this exam are in the above table. View the Previous Papers Page daily to get the Latest Tamilnadu State Jobs Papers and also the other state government jobs exam papers. For the TN Public Service Commission Group 2A exam preparation, if you are browsing for the Previous Question papers of CCSE Group IIA Exam. Then you are in the exact place. Because on our website, all the Tamil Nadu PSC Group 2A Exam Old Question Papers are available. Hence people can get the TNPSC Group 2A Previous Papers without difficulty from the available links. And also prepare a perfect plan to obtain more marks in this CCSE exam. Also, for this TNPSC Combined Civil Services Exam, you can find the exam pattern here. So make utilize of the TNPSC Group 2A Previous Papers and the exam pattern for the exam preparation. Hence you can secure more marks with better preparation. Before appearing the Combined Civil Services Examination of Tamil Nadu, check the Exam pattern that is available in the above table. Because knowing the scheme of the examination is an important work to begin the exam preparation. Also, see the official site of the Tamil Nadu Public Service Commission i.e. www.tnpsc.gov.in for further details about the Civil Services exam. The details here regarding the TNPSC Previous Papers are only for the guidance purpose. Hence the aspirants can view these Old Year Question Papers of TNPSC Group 2A Exam for perfect preparation. Also, see the official site of the Tamilnadu PSC i.e. www.tnpsc.gov.on for any doubts according to the CCS examination.